Rating - After the review. My friend was visiting me in Singapore, and we had a long day of walking behind us. 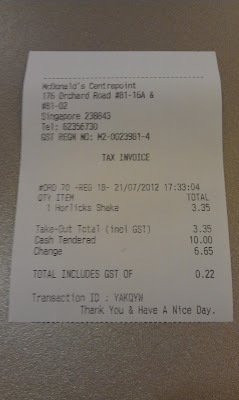 Earlier in the afternoon, he tried the Horlicks Crunch McFlurry, so he could say he tried something special from Singapore McDs, but as we walked passed the Centrepoint branch, I saw a large promotional poster saying 'Exclusive to this Outlet' and had a photo of the McFlurry, and a previously unseen Shake! Even though it was an terrible time to be having a milkshake, I still tried it, just so it wouldn't disappear on me like the Banana Nut McFlurry did a few weeks earlier. Though, I didn't finish it because it was already 17:30 and we had been eating quite a bit throughout the day, so I didn't want to spoil dinner. I watched the older woman (seems like most of the Ice Cream kiosks in Singapore are staffed by older female employees) make the shake and was very impressed. 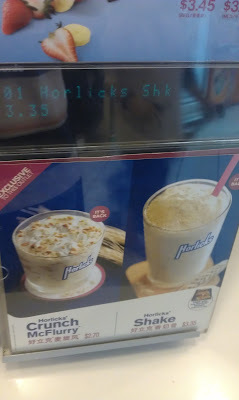 She but a couple spoonfuls of the Horlicks mix into the cup while the shake was being prepared, then she topped it off with another heaping spoonful (sadly, the restaurant was very busy, and hot, so by the time I found a seat, the Horlicks powder has slightly sank into the shake, but it looked even more impressive as it was handed to me. For as Asian desert item, it was surprisingly large, though the price wasn't exactly cheap, but I would have preferred a cheaper smaller cup. I think the Hazelnut McFlurry I had in Korea was the perfect size to cost ratio (you can compare it to the tiny Banana Shake I had in Japan!). On a related note, I am writing this from the Turkish Airlines business class lounge in Istanbul. 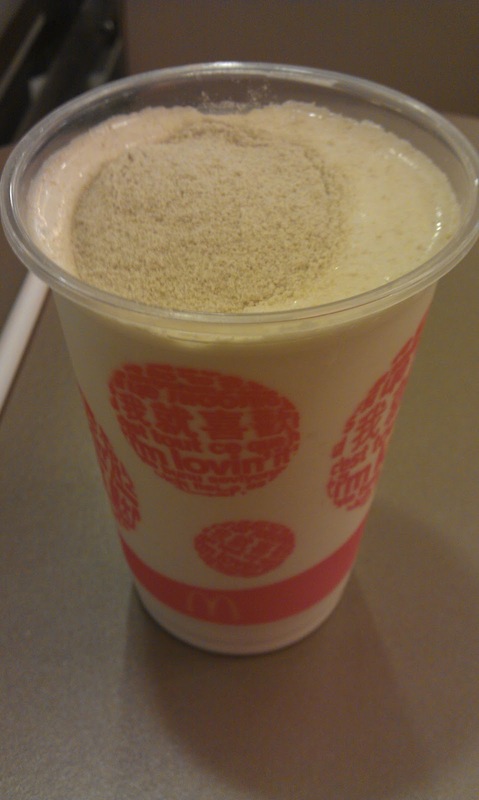 I checked out the local McD's today, and they had a new Kiwi Milkshake. Though I didn't try it (I tried something different), I kind of regret not getting it now. I also passed on their 'Chicken Pops' - AKA Chicken McBites, and their new range of burgers with Whole Wheat Buns. Look for my review of a more unique item to come soon. If anyone has any questions or comments fell free to post in the comment section below, or join the Facebook Page.